In baking, a puff pastry is a light, flaky, leavened pastry containing several layers of fat which is in solid state at 20 °C (68 °F). 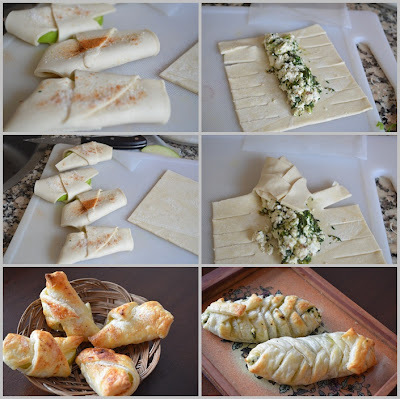 In raw form, puff pastry is dough which is spread with solid fat and repeatedly folded and rolled out (never mashed, as this will destroy layering) and used to produce the aforementioned pastries. The gaps that form between the layers are a result of the puff pastry rising as the water evaporates into steam during the baking process. where l is the number of finished layers, f the number of folds, and n the number of times the dough has been folded. Example: twice-folding (i.e. in three) for four times gives (2 + 1)⁴ = 81 layers. Chef Julia Child recommends 73 layers for regular pâte feuilletée and 730 layers for pâte feuilletée fine (in Volume II of her Mastering the Art of French Cooking textbook). Commercially made puff pastry is easily available in grocery stores. It is generally kept frozen and thawed before use. I am using a ready made puff pastry sheet for my recipe here but sharing the process for all those who want to do it themselves. 1) Cut the square sheet diagonally to make two triangles from each sheet. 2) Place the butter and apple slice on base of the triangle. 3) Sprinkle some sugar and cinnamon powder over it. 5) Sprinkle some sugar and cinnamon on the top also. 7) Grill it at 200 degrees preheated oven for 10 to 12 minutes. Serve hot. 2) Add some spinach and dry it well. Turn off the flame. Add crumbled feta cheese. Season it with black pepper and salt. 4) Keep the filling in between and fold the slits alternatively from both the side. 5) Repeat the process for rest of puffs. 6) Grill it at 200 degrees preheated oven for 10 to 12 minutes. Serve hot. 1) Sift the flour and salt in a large bowl. Roughly break the butter in small chunks and add them to the flour. Rub them in loosely, you need to see bits of butter. 2) Make a well in the bowl and pour in about 2/3 of cold water, mixing until you have a firm rough dough, add extra water if required. Cover it with cling film and rest for 20 mins in the fridge. 3) Turn out onto a lightly floured board, knead gently and form into a smooth rectangle. Roll the dough in one direction only, until 3 times the width, about 20 X 50 cm. keep the edge smooth and even. 4) Fold the top third down to the center, then the bottom third up and over that. Give the dough a quarter turn (to the left or right) and roll out again to three times the length. Fold as before. 5) Cover with cling film and refrigerate for 20 minutes. Repeat step 3 and 4. Chill it again for at-least 20 minutes before rolling it for use. 6) You can also refrigerate it in a zip lock pouch for future use. Tandoori Pomfret with a "Hint of Mint"
Silver or white pomfrets live in coastal waters off Middle East, South Asia, and South East Asia. Fish of this family are characterized by their flat body, forked tail fin and long pectoral fins. This fish is prized in the Indo-Pacific region for its taste. It is called "Pamplet" in Mumbai and "Vawall" in parts of South India. Pomfret fish is high in Vitamin D. It is also loaded with minerals such as iron, zinc and calcium. With so much of health benefits and taste why not to try a recipe with low in fat and high on flavors? "Tandoori pomfret" is made with marinating Indian spices and cooking it on a grill pan. Twist lies with a minty flavor which I am adding to this recipe. 1) Clean and pat dry the fish, slash the skin 2-3 times each side and put it in a bowl. 2) Crush garlic and mint leaves using a pestle and mortar. 4) Add all the ingredients to pomfret except the chat masala. Spread the marinate thoroughly on the fish. Cover the bowl using cling film and refrigerate for 30 minutes. 5) Spray some oil on a grill pan and put the marinated pomfret on it. 6) Cook for 4-5 minutes both side turning it once during grilling. 7) Sprinkle some chat masala over the cooked fish. 8) Crisp and spicy 'Tandoori Pomfret" is ready to serve. Last week my hubby gifted me a nice cookery cook on Thai cuisine from Thailand. 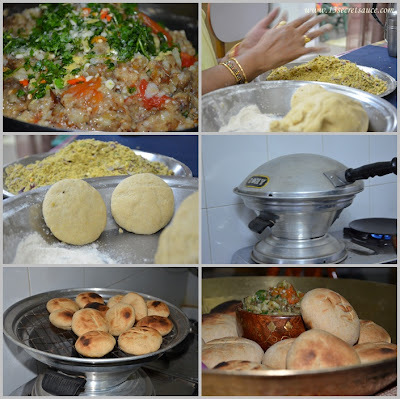 I was totally delighted and was so eager to try out new recipe very soon. Today's recipe is my first trial from this book. It’s a grilled pomfret with hot and sour chilli sauce which I am going to make today. It’s called “Pla Pow" in Thai. Whole pomfret is smothered in garlic, coriander and oyster sauce, then grilled to a deep caramel colour and served with flavoured jasmine rice. I am using the hot and sour chilli sauce for marinating as well to give it a tangy taste. Hope you enjoy cooking the recipe as much I do making them. 1) Rinse and dry a cleaned fish and slash the skin 2-3 times each side for marinating. 2) Pound the coriander and garlic using pestle and mortar. Add black pepper and oyster sauce. 3) Marinate the fish with the mixture both sides. 4) Blend all the hot and sour chilli sauce ingredients together and set it aside. 5) Add 2-3 tablespoon of sauce on marinated fish and reserve rest to serve with the grilled fish. 7) Place the fish on a lightly oiled grill pan. Cook for about 4- 5 minutes each side , turning once during cooking on a medium flame. 8) Serve it hot, garnish with mint and lemon wedges. Enjoy it with rice and prepared sauce. “Grapes Dumbbell” as the name suggests this recipe helps you exercise your sweet tooth without an extra pound. It is a supper fast and three ingredient recipe. Yes, you heard it right, Grapes, Chocolate and Cashews. Make these small bite sizes sweet for your deserts or starters and enjoy it with family and friends. 1) Grate or slice the chocolate bar and melt it in a microwave for 30 sec. You can melt the chocolate on a double boiler also. Keep it warm. 2) Grind the cashews roughly to get a bread crumb like consistency. 3) Insert the grapes from both the side of toothpick. Make all the pieces together and dip both the side in chocolate. Dip it back in cashew crumb. 4) Freeze it for 10-15 minutes and serve cold. 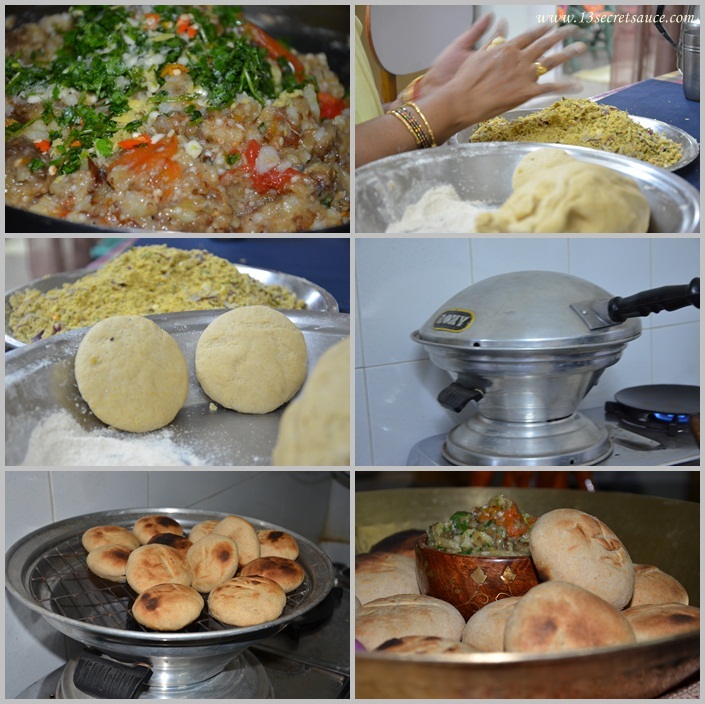 It can be made in advance before the any dinner/ lunch party. This recipe is dedicated to all those readers how want to make a fast yet healthy food/ appetizer. Perk up any appetizer buffet or antipasto tray with these tempting stuffed mushrooms. You will love the aroma of this mini delights brimming with broccoli, feta cheese, garlic, and oregano. 1) Clean the mushrooms and pat dry using a kitchen towel. 2) Remove stems from mushrooms carefully. Set stems aside. 3) Lightly coat the rounded side of each mushroom cap with nonstick cooking spray. Place mushroom caps, stem sides down, in a baking tray. Grill it at 200 degree C for 5 minutes. 4) For filling, Heat some oil in a pan. Add the 1 cup chopped mushroom stems, the broccoli, onion, garlic, dried oregano, salt, and pepper. Cook and stir for 5 to 10 minutes or just until tender and most of the liquid is evaporated. Stir in feta cheese..
5). Place mushroom caps, stem sides up, in the same baking pan. Spoon the broccoli mixture into mushroom caps. Grill it with fan mode on at 200 degree C for another 5 minutes. 6) Serve hot with your favourite sauce/ ketchup. Ask any true blood Bihari about the defining dish of Bihar and I can bet you about the answer "Litti-chokha". Having lived in Bihar most of my early childhood can recollect describing the whole setup as a wintry evening, star-lit skies, fragrance of fired cow dung-cakes, aroma of ghee being heated, and sound of kids playing around. To describe this iconic and intrinsically Bihari recipe to a non Bihari won't be easy. A dry mix of Sattu (described in my previous post) with salt, spices and spicy oil from a jar of mango pickles is made. Wheat flour is moulded into rounded hollow balls into which you fill this sattu mix. As the balls are getting formed, you stoke a “barbecue” with dried cow dung cakes (gointha). The sattu balls are then inserted into the smoldering fire with potatoes, aubergine and tomatoes following it for company later. After sometime, the vegetables are pulled out manually, followed by the littis. 1) Sieve the flour and add salt & refined oil. Knead the dough properly with water and make a stiff dough. Cover with a wet cloth and keep aside. 2) For stuffing: Take sattu or roasted gram flour in a bowl. Add all the ingredients and mix well. In case the stuffing is bit dry, you can add little water. 3) For Littis: Take the dough and make 6-7 medium equal sized balls. 5) Fill a portion of the stuffing and close the balls by lifting the sides by hand and flatten the littis a bit by pressing your palm. Keep it aside. 6) You can either use a cow dung cake (gointha) or coal to make a barbecue. You can either use a gas tandoor (I am using this). Else an easier option is to heat oil in a kadhai and fry the littis till golden brown. 7) Roast the littis in barbecue/ tandoor until nice and crisp turning around in between. 9) Peel of the burnt skin of the Brinjal and Tomato. 10) Mash boiled potatoes, Brinjal and tomatoes together. 11) Add all the other ingredients like finely chopped coriander leaves, salt, green chilies ginger, garlic and oil. Add salt to taste. Mix all the ingredients well. Break the litti in equal halves and put 1 tsp hot ghee in between. Relish it hot with chokha. New Year begins with new promises, resolutions and loads of happy wishes for everyone. I am back to blogging after a loooong vacation. Are you still stuck in vacation mode, why not to try something easy and healthy? Here I am with a “No Cook Cold Soup" made from "Sattu". I am sure most of you will recognize this age old recipe. A staple from North India, Sattu was originally made of roasted gram flour but has now evolved to include other nutritious flours like barley, wheat etc. You can buy it from any Indian grocery store. Sattu is a perfect blend of balanced nutrients and is prepared in one of the healthiest cooking methods – roasting. Its high fibre content makes it healthy for the intestines. And a low glycemic index is good for diabetics as well. It has cooling properties. Cold soups are a particular variation on the traditional soup, wherein the temperature when served is kept at or below room temperature. They may be sweet or savoury. In summer, sweet cold soups can form part of a dessert tray. An example of a savoury chilled soup is gazpacho, a chilled vegetable-based soup originating from Spain. 1) Mix all the ingredient in a big bowl. 2) Serve it cold or just below the room temperature as a soup or drink.